We only look after what we care about; but what makes us care about the ocean? Until recently, I never considered the origin of my caring. I just cared! Most people in my social sphere also cared. I had been in a like-minded bubble without realizing it. A result of having a pre-school child is mixing with a variety of other parents; some of whom have quite different values. Recently, taking my daughter on a play date, another parent referred to the ocean where we live (Pacific Canada and location of IMCC2) as “cold, smelly and dark”. I was met by a look of indifference when I explained that my wife and I are marine biologists and our love of the ocean. I failed at the time to convert them. Upon reflection, I pondered the core connection to the ocean. What led to our different perception of the ocean? Was it geography – because the other parent was from the Prairies? That would be a simple answer, but I know dedicated marine biologists based in Winnipeg (they do Arctic work if you were wondering). Wherever you live there is at least some connection to the ocean – for instance oxygen in the air we breathe, medicines, food and transportation of goods . So what made me see the ocean so differently to this other parent? The ocean, to me, is a source of great fascination and enjoyment. It dawned on me that I cared because I was exposed to nature and the outdoors at a young age leading to a strong personal affinity for the ocean. I beachcombed, rock pooled, fished, snorkelled, surfed and generally just enjoyed mucking about in and around the sea as far back as I can remember. It all started with rock pooling! I thank my parents for countless holidays in my early years sitting on often rainy and windy British beaches while I attempted to catch various intertidal fauna (blennies and gobies were a personal triumph). A beach holiday was not complete without a bucket and a net. I became interested in knowing more about the incredible array of shore creatures. In reality, I was a marine biologist before I even had a clue that such a discipline existed. I was lucky to be exposed to nature in a variety of ways as a child – whether making a frog pond, keeping fish, visiting museums, aquaria and parks, vacations with family and friends, or school trips. Similarly, when I talk to friends, within and outside of environment-related careers, their love of nature originates from childhood experience. Just writing about it brings a nostalgic smile to my face and something I can wax lyrical about over a whisky or a beer. More importantly, this early experience has major repercussions for how we value the natural world. It makes me realise that an important part of my children’s upbringing is to foster their engagement with nature. 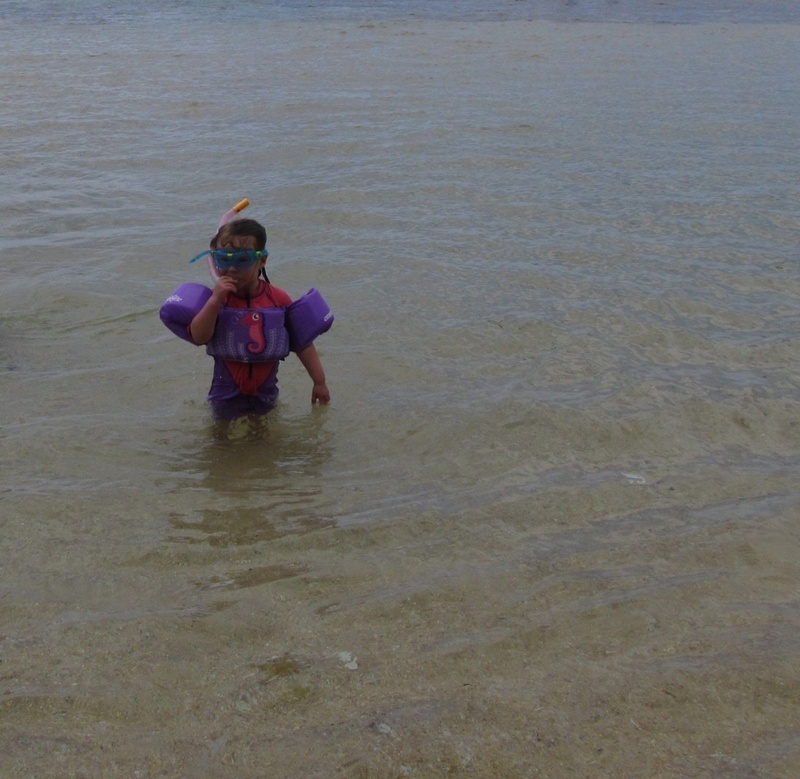 Luckily, with the aid of a leaky mask, my 3 year old daughter already likes looking underwater to see what’s down there. However, children are becoming increasingly disconnected from nature . The implications of “nature deficit disorder” are very concerning for health and education  and, in light of our use and abuse of the world’s resources, how we value nature as a society. This is especially worrying when environmental education is being assaulted [4, 5] or subject to potential corporate interference [6, 7, 8]. To borrow from Dr. Russ Markel “Unfortunately, at a time when the natural world needs stewardship and advocacy the most – overfishing, climate change, ocean acidification, and global loss of biodiversity, are but a few examples of current challenges – humans are becoming increasingly disconnected from it. Nowhere is this trend more striking than with the remarkable collapse of children’s engagement with nature. In the US, in just six years (1997- 2003) the number of children with outdoor hobbies fell by half (Louv 2005). In the UK, in just one generation, the proportion of children regularly playing in wild places has fallen from more than 50% to less than 10%, and 11- to 15-year-olds in that nation now spend half their waking hours in front of a computer screen (Louv 2005). Most concerning is that as children’s engagement with nature declines, so too does the likelihood that the next generation will engage in the social and political advocacy needed to protect it” . What does this mean for developing future generations of environmental stewards? It is crucial for our relationship with the planet to harness children’s intrigue  to connect them with nature [11, 12, 13]. To adapt a Jesuit maxim “give me a child and I’ll give you an environmentally conscious adult” . I urge all attendees of IMCC and marine scientists in general (including myself) to: (1) step outside of your bubble from time-to-time; and (2) think and act to engage younger people to build a curiosity and appreciation of the marine realm. James Mortimor is a marine biologist currently working in Canada. Find him on Twitter @Vit_Sea! The Ecology of Haggis: Food or Friend?